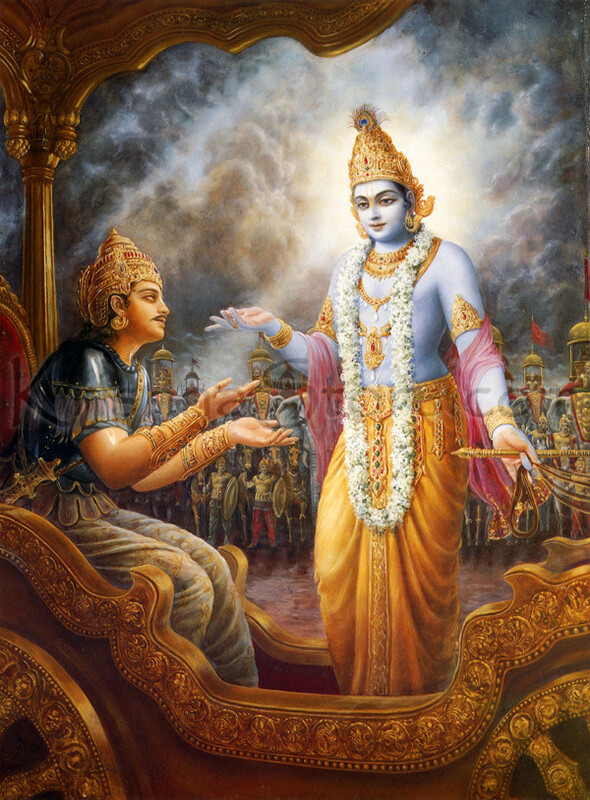 When Arjuna announces that he would rather beg for a living than to destroy his enemies, Lord Krishna scolds him for his weakness. He reminds Arjuna that he is a warrior by nature and warriors are meant to fight. To assume the role of a beggar, however simple and passive it might seem, would go against everything that Arjuna was born and bred to do, which is to fight with evil and maintain justice. Lord Krishna insists that everyone must follow their svadharma, their duty as determined by their nature, rather than paradharma, which is a duty that is not natural to them. People tend to interpret this passage as restrictive, urging a strict division between socioeconomic levels or castes. And as is usual with any religious texts, people have used such false interpretations over the ages to exploit and control both women and the less fortunate to keep rigid power structures intact. We were confused by the verse at first, not sure if this was a good thing since it seemed to dictate a strict adherence to one’s path with no chance of expanding it or changing it. It was only after I shared my confusion with my father, who happens to be a practicing sannyasi, that we found a clear and helpful explanation. Svadharma is based on our innate nature. To help me understand, my father used his own life as an example. He said that his own nature was extremely rajasic or active. He wanted as a young man to save the world, discover new sources of energy, harness the sun, dig deep into the earth, all in attempts to find solutions to society’s problems. As he began his career as a research scientist and later became a director, he wanted to be top dog, to supervise and manage projects. As he got older and became more spiritual, he channeled that same drive for activity and management into working for the Hindu Temple, starting a health plan for retired Indians, or becoming a meditation center leader. All the activities he indulged in were true to his rajasic nature. Going against that nature and deciding to be a monk before he was ready would have been foolish and painful, even though he was eager to go to the next stage and often asked his guru for the opportunity. His guru, being wise, kept advising him to wait, and to continue doing what came to him naturally. He knew what my father failed to realize at the time, that while becoming a monk might seem like the fastest and easiest route to liberation, it was not yet his nature to be still and engage in contemplation and prayer. As my father continued doing his naturally driven duty of being active in the world and helping others in whatever way he could, but still practicing sadhana, reading scripture, following a guru and being devoted to God, he says Kramasannyasam or gradual progress occurred. That is, from saving the world, to serving God in various ways, to finally wanting to become one with God and letting go of all those outside activities, he now wanted only to be quiet, to meditate and do japa. As that finally happened, he no longer had to convince his guru that he was ready. His guru came to him and offered to initiate him into sannyasa. As I began to finally understand the concept, my father continued, “Now let’s apply the same principle to you. If you were to come to me and say that you were ready to become a monk I would absolutely disagree, and here’s why. You started a Gita class six months ago with a small group. You meet every week and have discussions and do the homework. But that wasn’t enough. You also started a blog to spread the word to those who don’t attend. But that wasn’t enough either. You decided to start a second session and then a third. As it dawned on me just how strong my instinct for teaching is, compelling me to conduct three classes a week, during what is supposed to be my sabbatical and a break from my professorial duties, my father continued. Nothing like a personal example to make things crystal clear! So, unlike Arjuna who was a warrior by nature, ready and armed to fight injustice, but in a moment of weakness, thinking it would be easier, wanted to throw down his weapons and beg for a living (paradharma), we need to follow the svadharma of going through life, fulfilling our nature, rather than taking the easy way out, only to end up miserable. The only way to change and transform our nature is gradually, through sadhana. Eventually we will find our way. It turns out then that this passage that has been misinterpreted so often and caused so much confusion is really not about castes and restrictions at all, but a blessing from a generous God to live out our true nature rather than trying to submerge it. The Gita urges us to be true to ourselves, while living with a sense of devotion and gratitude and a spirit of surrender, so that we can eventually rise above our human nature and discover the divinity within. This entry was posted in Uncategorized and tagged bhagavad gita, gita study, hinduism, india, indian women, svadharma. Bookmark the permalink.